Southwestern Seminary desires to see teenagers who, for the glory of the Father and in the power of the Spirit, spend a lifetime embracing the full supremacy of the Son, responding to His kingly reign in all of life, inviting Christ to live His life through them, and joining Him in making disciples among all peoples. To that end, the seminary has presented a gift to the churches. 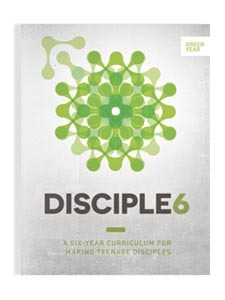 That gift is a comprehensive, six-year curriculum to be used with those specific teenagers who want to be disciples of Jesus. The studies are grounded in Scripture and include such content areas as apologetics, biblical interpretation, core doctrines, and evangelism and missions. Teenagers share in the leadership of the sessions. They prepare to disciple believers now and for a lifetime, nearby and to the ends of the earth. In addition to print copies, the Disciple6 curriculum is available as free PDF downloads and free smartphone/tablet downloads. Visit disciple6.com. The 66 Southwestern faculty members who wrote the Disciple6 lessons did so in order to express devotion to Christ and to make an investment in the Kingdom impact of the next generation. Contributing writers include Richard Ross, professor of student ministry; Candi Finch, assistant professor of theology in women’s studies; Travis Dickinson, associate professor of philosophy and Christian apologetics; and David Allen, dean of the School of Preaching.